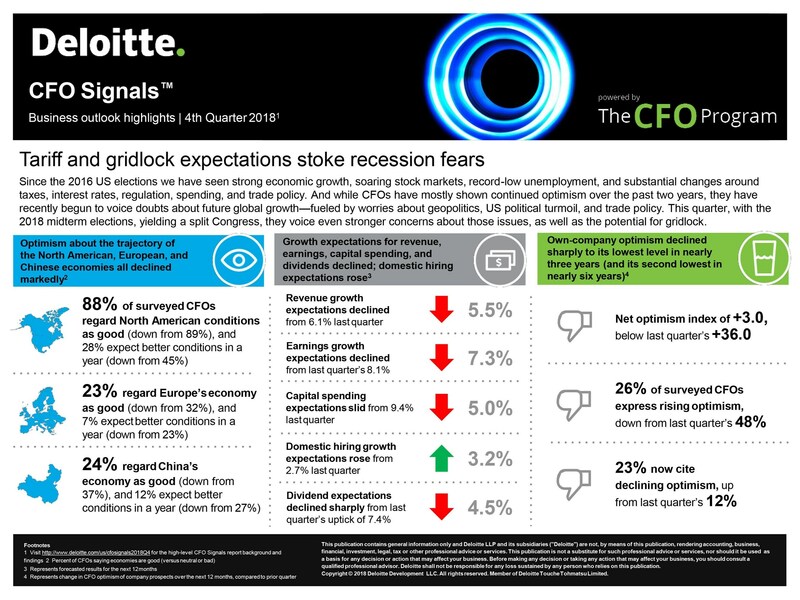 NEW YORK, Jan. 10, 2019 /PRNewswire/ — Deloitte’s CFO Signals™ survey for the fourth quarter (Q4 2018) of chief financial officers, representing many of North America’s largest and most influential companies, reveals that optimism regarding the future of North American, European and Chinese economies has declined. Fifty-five percent of the 147 CFOs surveyed expect a U.S. recession by the end 2020. Despite continued strong assessments of the current North American economy, CFOs’ forward-looking sentiments toward the North American, European and Chinese economies slid to their lowest levels in the last two years. While 88 percent of CFOs rate current North American conditions as good, only 28 percent expect better conditions in a year. Moreover, the vast majority of CFOs do not expect the U.S., Canadian or Mexican economies to improve next year. Compared to a year ago, CFOs’ expectations for business spending declined sharply, and those for labor costs rose. CFOs’ perceptions of Europe’s economy receded over the last three quarters after peaking in Q1 2018, with only 23 percent of CFOs favorable toward current conditions, down from 32 percent last quarter, and just 7 percent expecting better conditions in a year. Their perceptions of China’s economy fell for the second straight quarter, with only 24 percent of CFOs saying current conditions are good. Just 12 percent expect better conditions for China’s economy in a year, compared to 27 percent last quarter. Regarding own-company prospects, CFOs’ optimism plummeted to its lowest level in nearly three years. The net optimism index fell drastically from last quarter’s plus 36 to just plus 3 this quarter — the third straight decline. Just 26 percent of CFOs express rising optimism (compared to 48 percent last quarter), and 23 percent cite declining optimism (up from 12 percent last quarter). With the Standard & Poor’s 500 index experiencing a 4-percent decline since the Q3 2018 survey was released and equity market volatility rising, 65 percent of CFOs say U.S. equity markets are overvalued — the second lowest level since Q2 2016. For 62 percent of CFOs, debt attractiveness also declined for the fourth consecutive quarter, the lowest level in more than four years. Only 40 percent of CFOs say this is a good time to be taking on greater risk — the lowest level in two years. In Q4, CFOs voiced even stronger concerns about both trade policy and policy uncertainty. Similar to previous quarters, they cited growing worries about geopolitics, interest rates and future economic growth. New this quarter were worries around immigration and U.S.-China relations. When it came to internal risks, talent and execution of strategy remained at the top of CFOs’ worries. Their concerns about achieving growth and managing costs also rose. CFOs’ expectations for sales, earnings and capital spending declined and are at or below their two-year averages. Their expectations for revenue growth declined from 6.1 percent to 5.5 percent, on par with the two-year average for this metric. Signaling another drop, CFOs’ expectations for earnings growth declined from 8.1 percent to 7.3 percent, its lowest level in the last two years, while their expectations for capital spending growth declined sharply from 9.4 percent to 5 percent, a two-year low. In contrast, their expectations for domestic personnel growth rose from 2.7 percent to 3.2 percent, again above its two-year average. Regarding expectations for the capital markets in 2019, CFOs anticipate substantially higher interest rates and 10-year bond yields to remain below 3.3 percent. They also expect the U.S. dollar to remain strong relative to other major currencies. Further, they anticipate little change in their debt, cash and buyback plans, and less risk-taking from a year ago. To replace talent, CFOs plan to hire mostly highly-skilled workers and implement new technology. With U.S. midterm elections yielding a split Congress, CFOs voice even stronger concerns about legislative gridlock. Few expect personal tax rates to change, but some express concerns about a possible repeal of corporate tax reform. About one-third of CFOs expect Congress to fund new infrastructure, but many worry about the impact of new spending and entitlements on the national debt (94 percent expect it to rise). 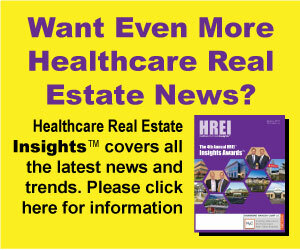 In addition, few CFOs expect progress on controlling health care costs, and they are split on whether the U.S. regulatory environment will get better or worse for their industry. Despite strong economic performance, CFOs have begun to voice this-quarter doubts about future global economic growth — fueled by worries about geopolitics, U.S. political turmoil, and trade policy. CFOs’ top hopes and fears for Washington over the next two years revolve around Congress’ ability to cooperate in getting meaningful legislation passed — and CFOs express overwhelming doubts. Many express specific fears about trade restrictions and hopes for stabilization of trade agreements. To see additional results from Deloitte’s fourth-quarter 2018 CFO Signals survey, download a copy at: http://www.deloitte.com/us/cfosignals2018Q4. The Deloitte CFO Signals survey for the fourth quarter of 2018 was conducted during the two-week period opening Nov. 7, 2018, and ending Nov. 20, 2018. A total of 147 CFOs responded. Seventy-four percent of respondents were from public companies, and 80 percent were from companies with more than $1 billion in annual revenue. For more information, please see the report. Deloitte provides industry-leading audit, consulting, tax, and advisory services to many of the world’s most admired brands, including more than 85 percent of the Fortune 500 and more than 6,000 private and middle market companies. Our people work across more than 20 industry sectors to make an impact that matters — delivering measurable and lasting results that help reinforce public trust in our capital markets, inspire clients to see challenges as opportunities to transform and thrive, and help lead the way toward a stronger economy and a healthy society. Deloitte is proud to be part of the largest global professional services network serving our clients in the markets that are most important to them.